Authors: PRANCE, Ghillean T.; ANDERSON, Anthony B. Authors: LISBOA, Regina Célia Lobato. Authors: LISBOA, Pedro Luiz B. 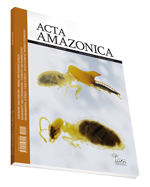 Authors: VILLA NOVA, N. A.; SALATI, E.; MATSUI, E.
Authors: SILVA, M. Leão da; MAIA, J. G. Soares; WOLTER FILHO, W.; MOURÃO, A. P.